This survey is 100% anonymous. Data collected from the survey will be used to help better promote Kris. Please also help ask other Kris fans to fill out this survey if you can. The more participants the better! Thank you! We made it! Kris Allen is one of seven finalists for Mashable’s “Must-Follow Musician on Social Network”. Now vote every day! Thanks to everyone who nominated Kris Allen for Mashable’s “Must-Follow Musician on Social Network”, Kris made it and now we need to vote daily to make him the winner! Kris is up against Super Junior, Girls’ Generation, Adam Lambert, Ricky Martin, Snoop Dogg and Lady Gaga, it won’t be easy but I bet Kris would be really happy if he wins, and I’d really, really love to make Kris happy. How about you? You can vote once per account per day. So if you have multiple Twitter/Facebook accounts, vote from as many accounts as you can stand every day. Check the check box next to “Share my vote” to spread the word about the award and ask your friends to send in their own votes. When you’re done, click “Vote”, and that’s it! Please visit that web page every day to vote for Kris if you can. Voting ends Dec 16. 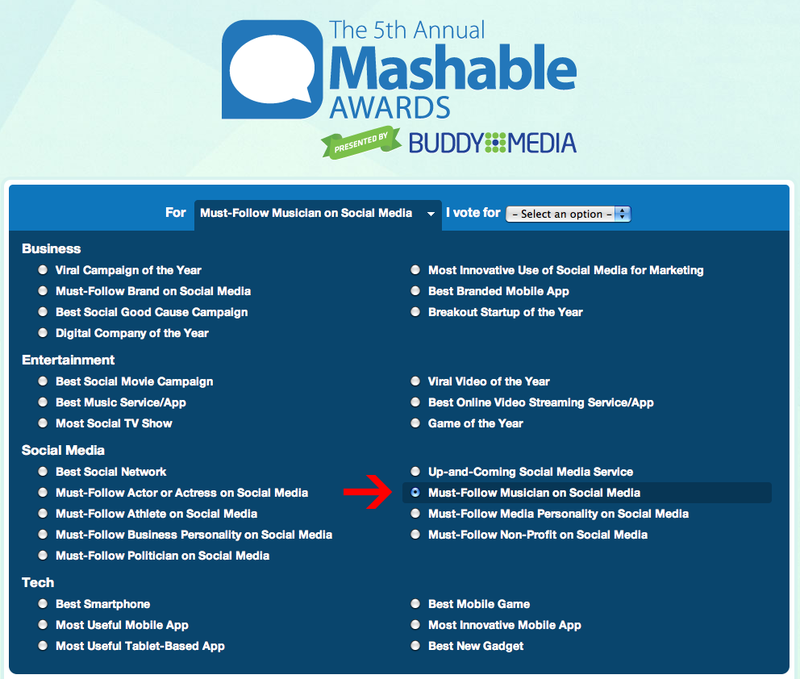 Awards winners will be announced on Mashable on Dec 19. Following the competition, Mashable will celebrate the winners at MashBash CES on Jan 11, 2012, at the 2012 International CES convention at 1OAK, the hot new nightclub at the Mirage Hotel in Las Vegas. Nominate Kris Allen for Mashable’s “Must-Follow Musician on Social Network” award! Please take a minute to nominate Kris Allen for Mashable’s “Must-Follow Musician on Social Network” award. You can nominate once per account per day. If you check the check box next to “Share my nomination”, you can help bring awareness to the award and ask your friends to send in their own nominations. When you’re done, click “Nominate”, and that’s it! Visit that web page everyday to nominate Kris if you can. Nomination ends Nov 18. 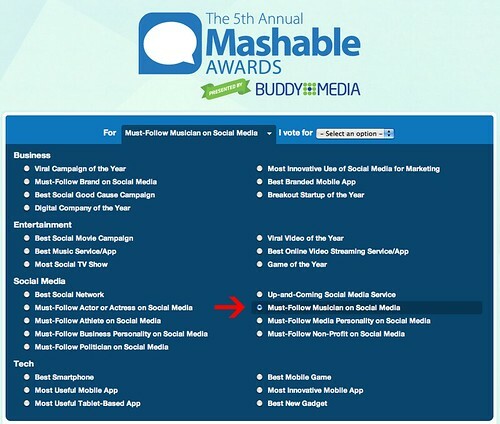 Mashable’s editors will select seven finalists for each category, and finalists will be announced on Nov 21, then readers will vote for the winners. Awards winners will be announced on Mashable on Dec 19. As of the time of this post, Kris already has 272,353 Twitter followers, so it’ll only take 27,647 more to reach 300,000! Spread the word far and wide! Tell all your friends and family to join Twitter (it’s fast and free!) and follow Kris! ps. Before you demand, “But this is unfair to the existing followers!” Worry not, you can unfollow and follow Kris again, maybe you’ll just happen to be the lucky 300,000th! Updated: Kris has changed the rule from the “300,000th follower will get a song written about them” to when he gets to 300k followers he will “pick a random fan and write a song about them”, because Kris is awesome like that. Sure RT @summerr26: @krisallen YOU SERIOUS?! AM I ALLOWED TO MAKE A BUNCH OF ACCOUNTS AND FOLLOW YOU? 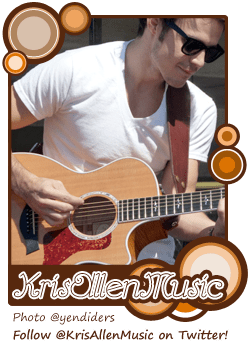 Help raise money for charities by putting yourselves on the Kris Allen Fans Map! Little Pawns, the official Kris Allen street team, wants to know where in the world are the Kris Allen fans. They created a map where fans can add markers to represent themselves in just a few simple steps. Not keen on registering yet another account (believe me, I KNOW)? Fear not, just shoot Little Pawns an email and they’ll handle everything for you. 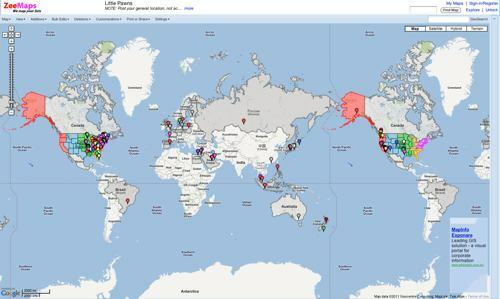 To sweeten the pot, a couple of awesome Kris fans are donating money to varies charities for every marker that gets added to the map. Head over to Little Pawns’ forum and find out how to add yourself to the map and raise money for charities in the process.